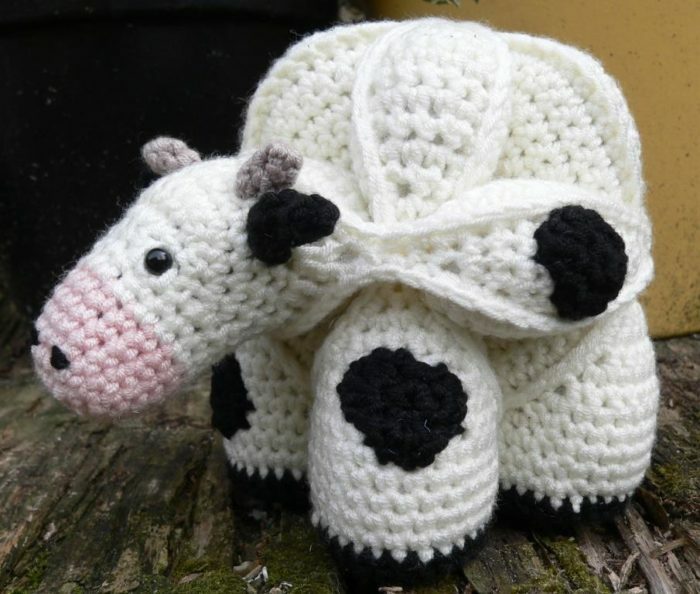 Amamani is short for Amigurumi Amish Puzzle Animals. They are based on the traditional Amish puzzle ball and, as such come apart into three segments (or rings) which have to be assembled to form the animal. The Amish Puzzle Ball has been around for donkey’s years and is “traditionally” made out of fabric. It consists of 12 wedges/cones that are attached or assembled in such a way that they form a ball. As the name implies, it is a puzzle, or at least it should be a puzzle. In most tutorials/patterns, the wedges are actually sewn together. The resulting balls have the same appearance as the puzzle ball without the actual puzzle element. 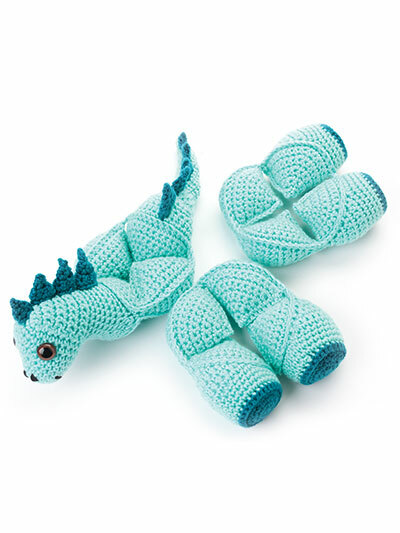 Even so, these toys make excellent grab balls for tiny hands and, depending on the fabric/colours you choose, can be a real treat for inquisitive eyes and minds. 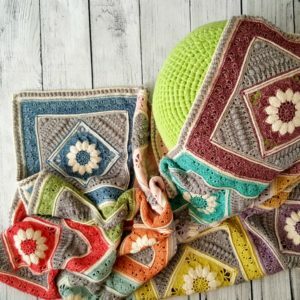 Because the crochet hook is my weapon of choice, and I wanted an ACTUAL puzzle, I wrote a pattern for a Crochet Amish Puzzle Ball. 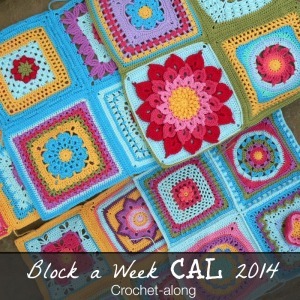 This pattern is FREE and suitable for beginners. 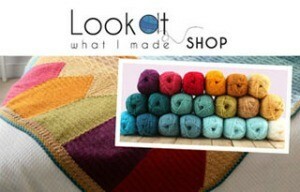 All my Amamani are based on this simple pattern. Just as the ball comes apart into 3 segments that can be assembled and taken apart at will, so each animal comes apart into 3 separate sections, which then have to be re-assembled in a specific configuration. Please note: not all of the animals are configured in the same way. Although the puzzle is a simple one and can be built blindfolded once you’ve done it once, it can be quite challenging for someone who has never seen one before. My 4-year old can finally assemble the ball by himself. My 2-year old still runs up to me every now and then to tell me that one of the animals’ “face fell off”. Anyway…after designing the original puzzle ball, and because I love all things flowery, I adapted the design to form the Flower Amish Puzzle Ball. It took me about three months of playing with the idea and a month of active “designing”. 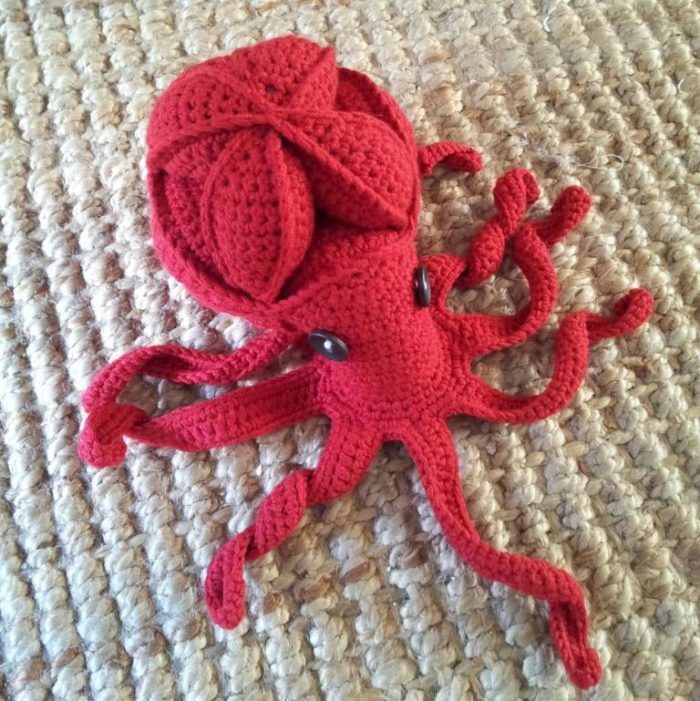 You have no idea how many drafts and versions of the head I had to make to figure out how to shape it as I had never designed proper Amigurumi before. 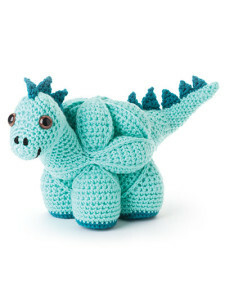 But when I finally assembled the three segments and saw my little dinosaur for the first time, I was smitten… and immediately obsessed. So please allow me to introduce you to my menagerie of Amamani. I will be adding more as they appear, so if you don’t see anything you fancy, come back in a few months and you might have a lot more to choose from! I have now published my very first book. Yippee! It contains 5 of the patterns below (6 variations in total), so these patterns are no longer available as stand-alone patterns. 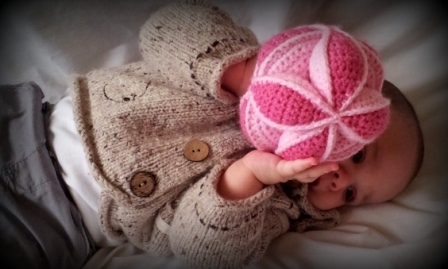 The rest of the patterns can still be bought individually in my Ravelry Store. The book is available in paperback and digital format from Annie’s and you can find it here: Amamani Puzzle Balls . It is also available on Amazon HERE . 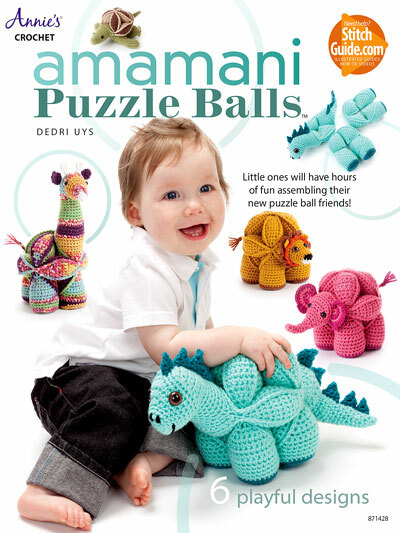 This pattern is no longer available as a stand-alone pdf, but rather as part of this book: Amamani Puzzle Balls . 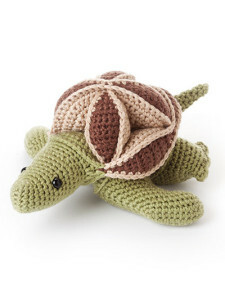 Skillie the Turtle works up to 12 cm high by 18 cm long (5″ x 7″). His front leg span is also 18 cm for what that’s worth (7″). Like all my other Amamani, he comes apart into 3 segments that have to be “built” to form the Turtle. 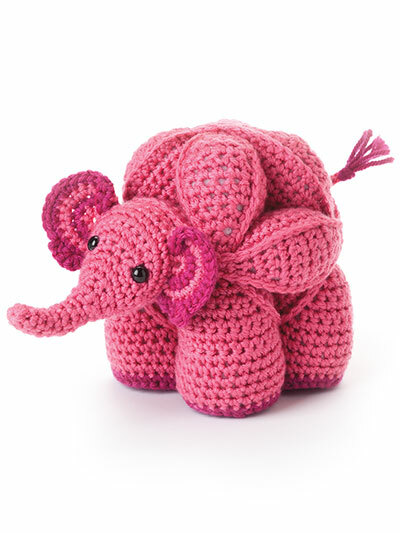 Eleanor the Elephant works up to 15 cm high x 15 cm long (6″ x 6″). Like all my other Amamani, she comes apart into 3 segments that have to be “built” to form the Elephant. I also have a FREE pattern for Grace the Crochet Elephant Comfort Blanket. Together they would be the perfect gift for a new baby! Olive the Octopus works up to 12 cm in diameter (that’s roughly 5″). Like all my other Amamani, she comes apart into 3 segments that have to be “built” to form the Octopus. 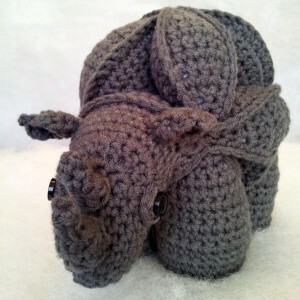 This is the easiest of all the Amamani, both to crochet and to assemble. Pattern available in my Ravelry Store. Hermione Horse works up to 20 cm high by 20 cm long (that’s roughly 8″ x 8″). Like all my other Amamani, she comes apart into 3 segments that have to be “built” to form the Horse. 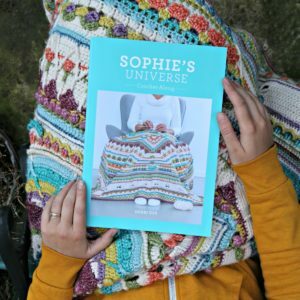 Although the pattern is written for 6 colours, it is easy enough to disregard the colour changes and just make her in one colour. 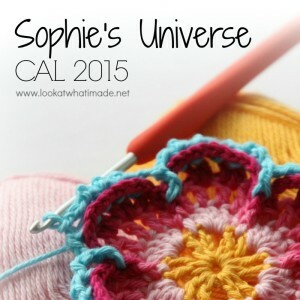 For Hermione’s head, you will need to join in the round and use short rows. You can find out more about both here. Gregor the Rhinosaur works up to 15 cm high by 15 cm long (that’s roughly 6″ x 6″). Like all my other Amamani, he comes apart into 3 segments that have to be “built” to form the Rhinosaur. For Gregor’s head, you will need to join in the round and use short rows. You can find out more about both in this partial walk-through of the Rhinosaur head. This dinosaur works up to 15 cm high by 25 cm long (that’s roughly 6″ x 10″). Like all my other Amamani, he comes apart into 3 segments that have to be “built” to form the Dinosaur. Gemina the Giraffe works up to 12 cm long (not counting her head) and 23 cm high (that’s roughly 5″ x 9″). Like all my other Amamani, she comes apart into 3 segments that have to be “built” to form the Giraffe. 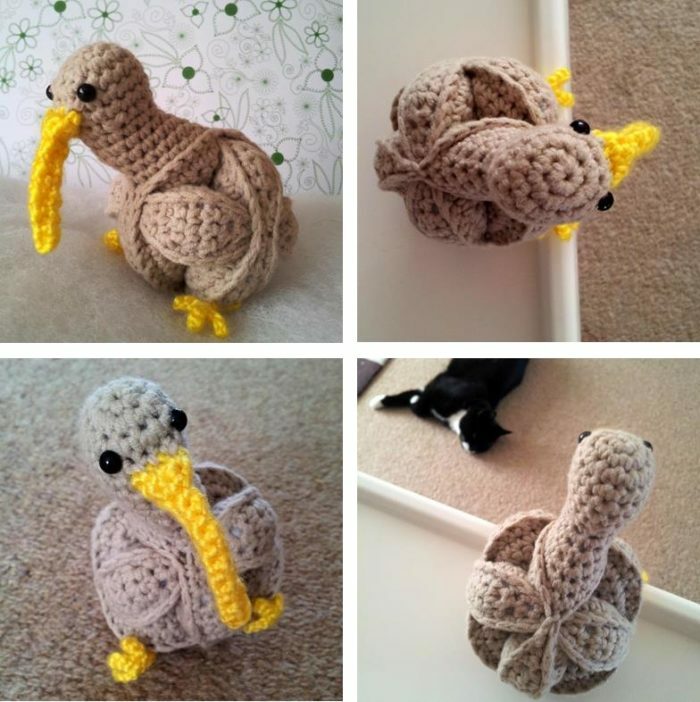 The crochet Kiwi Puzzle works up to less than 10 cm in diameter (that’s roughly 4″). Like all my other Amamani, she comes apart into 3 segments that have to be “built” to form the Kiwi. Along with the Octopus, this is the easiest of all the Amamani, both to crochet and to assemble. 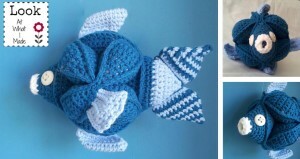 Fin the Fish works up to 13 cm wide x 17 cm high x 18 cm long. That is roughly 5″ x 6.5″ x 7″. Like all my other Amamani, he comes apart into 3 segments that have to be “built” to form the Fish. 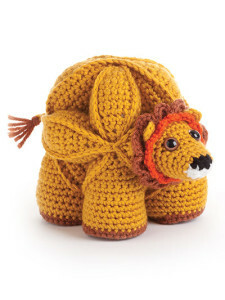 Brill the Lion works up to 13 cm wide x 15 cm high x 15 cm long. That is roughly 5″ x 6″ x 6″. Like all my other Amamani, he comes apart into 3 segments that have to be “built” to form the Lion. 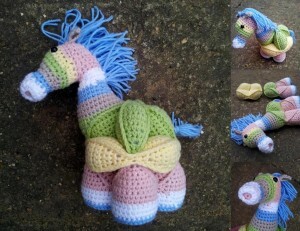 Included in the pattern are instructions for making both a cutesey mane AND a manly fringe mane. Chloe the Cow works up to 13 cm wide x 15 cm high x 15 cm long. That is roughly 5″ x 6″ x 6″. Like all my other Amamani, she comes apart into 3 segments that have to be “built” to form the Cow. Chloe comes complete with a cute little Udder. Hi Lucy. The Dedri’s book is available via Amazon. I know this is an old post, however I have recently purchased your book and have made a dinosaur and an elephant for my nieces. My third niece would love a bear and I was wondering if you have a pattern for any type of bear (polar/panda/teddy etc). Thanks. Oh my goodness! I knew they were called puzzle balls but never knew why—did not know they came apart. 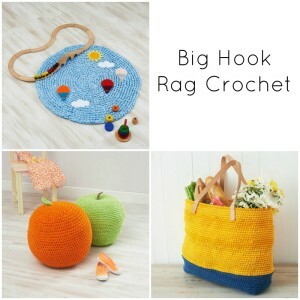 Thought they were crocheted as one piece. Definitely going to order the book. The patterns look so cute. I forgot to mention that I cannot get safety eyes so I make large French knots and use fray check to make sure the ties inside do not unravel. I am crazy about the puzzle ball animals. I found the directions a little confusing at first. I have made all of the animals in your book. Now I am trying new ones. I have made a penguin and panda. Hi, Dedri! 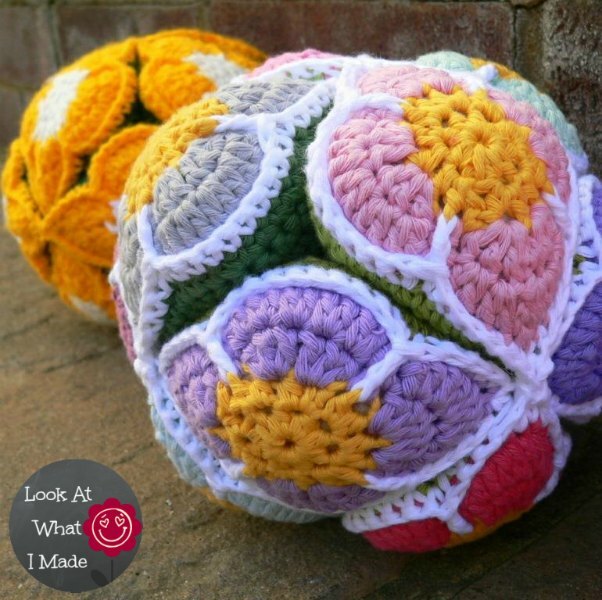 I just completed your free pattern for the puzzle ball, and found the instructions easy to follow. Thank you so much! And, I just bought your book of animal puzzle balls, and notice that they are marked “not intended for children under 3”. Can you explain how you came to that conclusion? I plan to use safety eyes, but I am really careful about baby and children’s safety. Thank you! I make the balls for kids of any age and take appropriate precautions with the safety eyes, just like you. I did not put the disclaimer in the book. I think the publishers put it there as a legal requirement for anything that uses safety eyes. I have loved making your Amamani’s!!! To this date I have made about 30 of them. I have had fun modifying heads to make different animals. I have a darling hippopotamus that you might like. All the pictures are on my Facebook page. Thank you. Making and selling them paid for the fabric for my daughter’s wedding dress. Hi Lisa. I can’t comment on your posts, but I have just had a look at them. Your hippo is very cute :) I don’t have a bundle, but if you use the contact me button at the top of my site to send me an email, we can chat about getting you all the patterns. 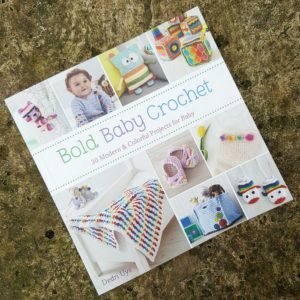 I found your book and have really enjoyed the patterns you’ve created. It was a challenge as I am not that good at crocheting yet, but I wanted to know if you happen to have a pattern for a dog? My friend is having his first baby, and I thought this would be a great gift since the guy and his wife are pretty much geniuses in their fields and I figured their baby would have to be too! Haha. If you can help out, that’d be great! Thank you! H Hoozuki. I did start on a dog, but I didn’t like the way it looked, and I’ve just not gotten around to tweaking it, so there isn’t a pattern for a dog yet, sorry. I hope the book wasn’t too much of a challenge for you! It says free patterns I would recommend take this off since they ain’t free. Saw the reviews of the crochet animal book and people are having a difficult with the heads or tails……. Instructions seem not to be clear enough. I would love to acquire the book but I think Annie should made adjustments. Would love to make the animals. Hi Maly. 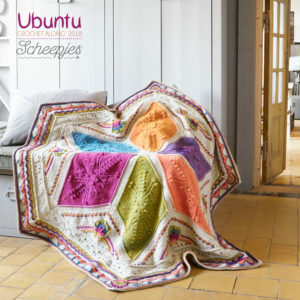 If you could point me to where it says ‘free’ in relation to the amamani patterns I will gladly correct it as they are all (apart from the Octopus) paid patterns (most of them available only in the book). 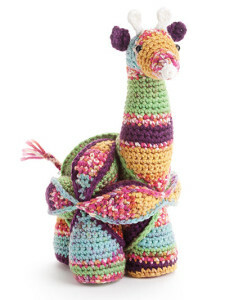 The patterns use short rows and most people are not familiar with using short rows to shape crochet toys. We have, therefore, included step-by-step photos to help them with this, as well as numerous references. 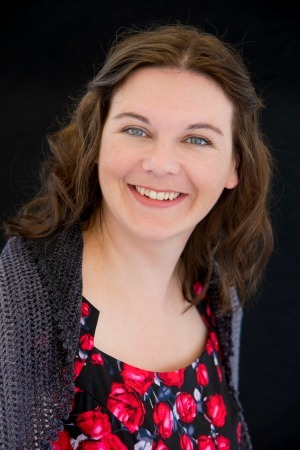 If you have feedback as to how these instructions can be bettered, please feel free to contact me through the ‘contact me’ tab at the top of this website and I will pass your suggestions on to Annie’s. the trunk was a bit wonky as I was using a textured yarn and hadn’t bothered to mark the ends of rounds. I find them really intriguing and plan making some more – may try to do one of my dog, which could be tricky as he’s mostly black. I found your book at a store and fell in love with it. I’ve been having fun making these for my first grandbaby due to arrive in a few months. The instructions were a little confusing at first, but once I figured out the flow of the instructions in the book it made sense and I’ve made 4 of them. I’m going to use some of the left over yarn to make some amish puzzle balls that my grandbaby can play with until she’s old enough for the animals.